The authors present the first objective and carefully documented study of this new occupation and explore its development, operations, and future prospects, as well as its significance for both the legal services delivery system and the consuming public. 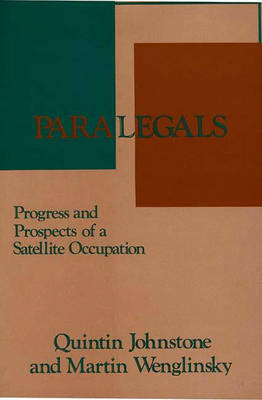 Drawing on extensive field research involving both paralegals and lawyers, the authors compare the different settings in which paralegals are employed and the characteristics of their training and organizations, how they function on the job, and what controls are maintained by the lawyers for whom they work. The authors discuss bureaucratization of legal offices--weighing the claims of efficiency against the need to maintain a professional standard in the delivery of legal services--and trace the significance of both professionalism and bureaucracy in the evolution of the paralegal occupation. Finally, they look at present trends and the possible future role of paralegals, offering recommendations on how to improve the utilization of paralegal services.